Cichlid fishes are supposed to rely highly on their visual abilities during survival routines like food detection, gender recognition and predator observation under various ambient light conditions (Fryer & Iles, 1972). Specific variations of niche, habitat and mate selection are reflected as structural and chemical differences in the retinas (van der Meer et al., 1995; van der Meer & Bowmaker, 1995; Carleton & Kocher, 2001; Terai et al., 2002; Spady et al., 2005). It is plausible to expect that species with different visual abilities (resolution and sensitivity) like many closely related haplochromines do not share similar potentials of visual prey detection. The ability of prey detection at various light conditions has been studied in a comparative way with adult specimens of H. argens and H. pyrrhocephalus. Two adult specimens of the F2 and F3 generation of . H. argens and H. pyrrhocephalus from the life stock at Leiden University were separately placed in a tank (44 x 27 cm) with a water level of ca.10 cm before they were offered separate specimens of red mosquito larvae (Chironomus species) during daily sessions at a specific light intensity. With the aid of a circulatory system the water was constantly filtered and kept at a constant temperature of 25 degrees C. The mosquito larvae were selected on size (11 mm) and separately added to the input flow of the tank’s circulatory system at an interval of ca. 1minute. In order to prevent satiation no more than 60 larvae were offered per day to each fish. The grey filters equally absorbed in the visual spectrum (400 – 700 nm) but they were transparent for the longer wavelengths. Below the glass bottom of the tank a mirror was mounted under an angle of 45o. Using an infrared sensitive video camera (ITC CTC-5000) silhouette images of fish and prey could simply be recorded. Each specimen could adapt to the described conditions for at least a week before the experimental sessions were started, which took about two more weeks in each case. After the last session each fish was anaesthetized with MS222, measured (standard length according to Barel et al., 1977 and lens radius r using an Olympus dissection microscope) and returned to the life stock. 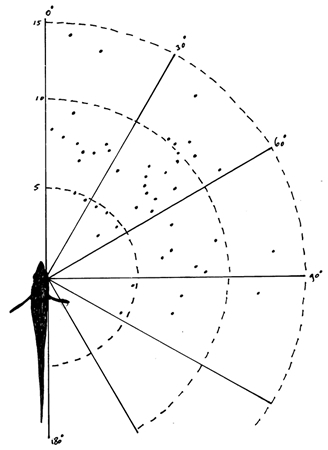 the reaction angle (RA) which was the angle between the RD-vector and the long axis of the fish. RA and RD together produced the shape of the reaction field within which a prey could be seen and the angles were ranged in four categories: 0-30 degrees, 31-60 degrees, 61-90 degrees and 91-180 degrees. Three statistical analyses were used to compare the various data. The relation between the mean RD and the various light levels was checked using one-way analysis of variance (Anovar in Statgraphics). Mean RD’s were compared between individuals and groups, using two-sample analysis results (Twosam in Statgraphics). Mean ST’s were compared between individuals and groups, using double-sided Mann-Whitney-test. In order to detect an object at a certain distance it is not only size that matters. If there is no contrast between the reflected light of the object and the background light, either in spectral composition or irradiance, the object will remain invisible. To detect an object that fits within the minimum separable angle its reflection should generate an on or off impulse signal of the centre or surround receptive units respectively. For instance, at light conditions close to the threshold of a photopic unit, a dark food particle can still be seen at relatively long distance, as long as the receptive unit on which it is projected does not generate an impulse whereas the surrounding units still do. When the light drops to a level that the background light no longer generates an impulse in the surrounding units, the object may still do, provided that it is closer to the eye. For the reflected light increases with the square root of the distance. Accordingly, object detection is subject to resolution at higher light levels, whereas at poor light conditions object detection is rather subject to sensitivity. When comparing two species with a different photopic unit size one may expect that under sufficient light conditions the same object is detected over a longer distance by the species with small units and high resolution. At low light levels, on the other hand, the species with large units is expected to detect this object over a larger distance. Both H. argens and H. pyrrhocephalus showed under each light condition a saltatory search strategy: alternately the covering of short distances and short stops. 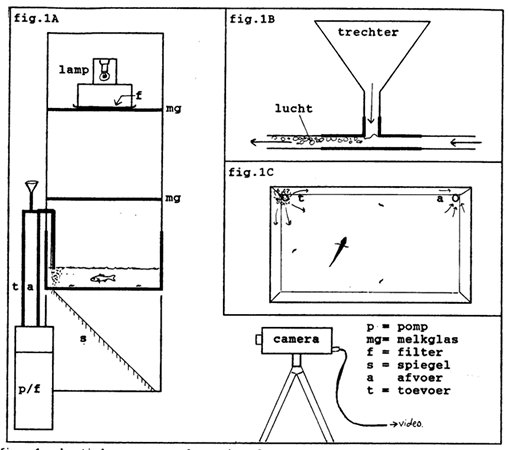 The saltatory search strategy is typical in visual food detection by fish ((O’Brien, 1979) and responsible for much variation of the reaction distance. Browman et al. (1990) presumed that in fishes using the saltatory search strategy, the visual acuity would be underestimated when derived from the mean reaction distance. Instead, estimations of visual resolution should be derived from the maximum reaction distance.. The observed decrease of the reaction distance and increase of search time during a gradual dimming of available light, leaves no doubt about the importance of vision in cichlids as they search for prey. The optical quality of the cichlid eye is most likely a necessary condition for their survival. The shape of the reaction field was composed of the combined RD’s and reaction angles (RA) in these species and was not surprising since the highest densities of receptive units which are located in the caudal part of the retina were already associated with best acuity in forward direction (Van der Meer et al., 1995). The consistently shorter search time of H. pyrrhocephalus at lower light levels coincides with the earlier expectation that this species has more sensitive receptive units due to larger double cones than H. argens (Van der Meer et al., 1995).This was confirmed by the lesser decrease of the reaction distance at lower light levels in H. pyrrhocephalus. At the highest light level of 35 lx H. argens had more acute vision (a = 33’) than H. pyrrhocephalus (a = 47’). At lower light levels the difference became the other way round as the RDmax (as well as the RDmean) of H. pyrrhocephalus decreased to a lesser extend in dim light than in the case with H. argens. This confirms the opinion that visual prey detection depends on both resolution and sensitivity and that it is not a proper tool to calculate acuity unless he light level is kept constant (providing acuity at that light level alone).